A number of users employ iPhone 6 nowadays. And out of these users, almost all of them face some or the issues every day. And one of such issues is iPhone 6 microphone problems. People are searching numerous forums for a solution on this issue. And it turns out that they are unsuccessful till now. And today we have brought you some solutions that can solve this issue. But before we began, what exactly is this issue? Well, if you think that you are facing iPhone 6 microphone muffled issue, then you might be experiencing that your microphone is not working fine. It might work sometimes or it might not work at all. If so is the case, then you are definitely facing the microphone not working iPhone 6 issue. Here are some solutions for your issue. Playing with the noise cancellation feature might come handy here if your rear/back microphone not working iPhone 6. The feature helps you to cancel out background noises. If you just turn it off and then on again, it might possibly solve your issue. Here are the steps that you need to follow. Step 2: Toggle off the option for Phone Noise Cancellation option. Step 3: Turn it on again and check if the issue is solved or not. Sometimes, the microphone can also be damaged due to external factors such as water and dust. And in such cases, you need to make sure that your microphone is not affected by it. Hence, check if the microphone is clean or not. Remove any dust or debris that is present there. Use paper or a thin substance can be used to clean the microphone without damaging it, thereby solving microphone problems on iPhone 6. Restarting is one of the most common and yet affective solutions that you can try. All you need to do is follow the given below steps. Step 1: Long press the Sleep button and the Home button of your iPhone 6 for almost 8–10 seconds. Step 2: Hold the combination till the screen will go off and the Apple logo appears on the screen. If the issue is caused due to a glitch or error in the iOS, you need to update it. Here are the steps that you need to follow. 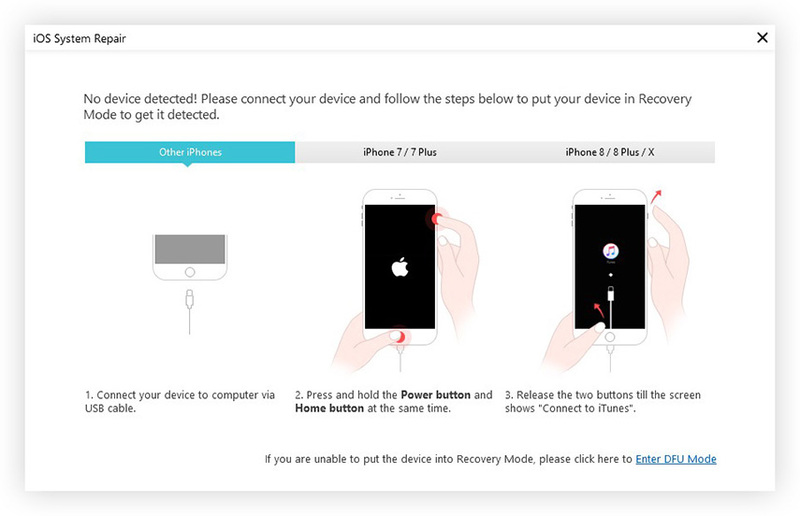 Step 1: In order to update your device, you will need to connect your iPhone to a power source. Step 2: Go to Settings >> General >> Software Update. Step 3: If the update is present, all you need to do is download and install the update. If the issue still persists, then perhaps resetting all the settings might help. This will not erase the data, but will reset all the changes that you made to the settings. Here are the steps that you need to follow. Step 1: Go to Settings app and head to General. Step 2: In General, you need to look for Reset option. Step 3: In Reset, click the Reset All Settings options. Your job is done. If you still see the issue, you might need to restore the iPhone with the help of iTunes, which might lead to loss of data. Here is a step-by-step guide for you to follow if you think that iPhone 6 microphone is muffled on calls. If data loss is the thing that worries you, then using Tenorshare ReiBoot is ultimate solution. This tool will solve all the issues that your iPhone is facing, such as iPhone microphone problem, iPhone overheating, Apple logo screen, iPhone frozen and more without any data loss and that too with a single touch. Here are the steps that you need to follow. If the issue is due to external damage to the hardware, you need to visit the iPhone service center and get your microphone fixed. Make sure that you do not try to repair it on your own, thereby worsening the condition. All do not use duplicate or fake products. Seeing the big picture here, you just had a look on top 8 solutions that can be used to solve iPhone 6 problems with microphone. Amongst them, using Tenorshare ReiBoot is the best way to solve this issue seamlessly.